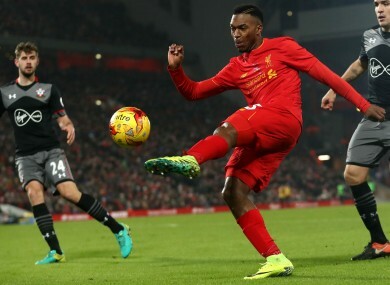 JAMIE CARRAGHER CLAIMS Daniel Sturridge offers nothing when he does not score after the Liverpool striker endured a disappointing game in their EFL Cup semi-final exit to Southampton. Liverpool missed out on the Wembley final as Shane Long’s late goal at Anfield ensured a 1-0 win and a 2-0 aggregate triumph for Southampton. Sturridge missed two excellent chances for Liverpool, firing a close-range volley over and then turning James Milner’s cross above the frame of the goal from three yards out. “When he [Sturridge] plays and he does not score you are basically down to 10 men because he does not offer anything else,” Carragher said on Sky Sports. The only reason to have him in the team is for his finishing ability. He does not do anything else in the game now. “He is a completely different player now to what he was when he first came under Brendan Rodgers. He used to give you penetration in behind and he had pace. Email “'When he does not score, you are down to 10 men' - Carragher blasts Sturridge”. Feedback on “'When he does not score, you are down to 10 men' - Carragher blasts Sturridge”.